House and time at Malvern: No 6, 1910 - 1914. Died: 08 June 1917 aged 21 in France. Killed in action at Messines. Son of William Ord MacGregor, Hazaribagh, Chota Nagpur, India, and Ranchi, India b. 1896. Upper Shell—Army I. School Prefect. 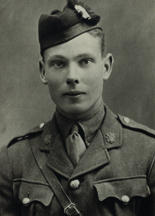 Great War, 2nd Lieutenant Highland L.I. 1914; R.F.C. 'His intention on leaving School was to go into business, but he joined up at once in the early autumn of 1914, and received a commission in the Highland L.I. Later he transferred to the R.F.C., and after the usual training went out to France where he was killed in action on June 8th. "His O.C. speaks in the highest terms of the gallantry displayed by the contact control which was shot down by direct hit. He was considered by the infantry to have done magnificent work in his endeavours to identify our line." As a schoolboy, Tom MacGregor was a boy of quiet studious ways, and never very prominent at games; popular in his House and in the School, and respected for his simple hearted honest nature.' (Malvernian, Jul 1917). He joined the H.L.I. and was in the Ypres salient all the winter of 1915/16 and was wounded on May 10th 1916.